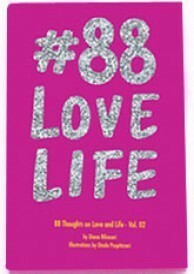 Consisting of 88 quotes and stories on love and life, this book offers a happy approach on overcoming sadness, failures, worries and changes in life – all written in a light and easy manner. Expect more good energy and more eye-pleasing illustrations that will brighten up your mind and day. The goal of this book? To make you smile.